Under a Desert Sky is a candid and compelling read! When faced with her own cancer diagnosis, as well as the diagnoses of both her parents, Lynne Hartke wrestled with a myriad of thoughts, questions, and emotions. Relating her experiences to the Sonoran Desert, Hartke illustrates both the desolation and the beauty to be found in life’s desert places. 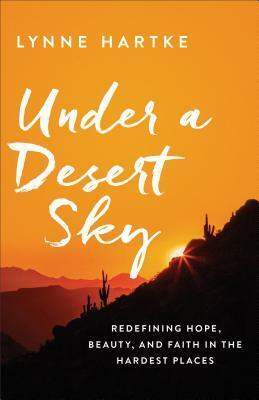 Heartfelt and hopeful, Under a Desert Sky is a stirring memoir! There comes a time in life when we find ourselves in the desert place of burning questions: Why? and Why me? But even as we shake our fist heavenward, the heart whispers another question: Who? Who are you, God? Who are you to me? Against the backdrop of the Sonoran Desert, Lynne Hartke asks her own hard questions as cancer arrives like a thief with one goal: to take it all. Hair. The contents of a stomach. A marriage. A life. As her days become a blur of doctors’ appointments, treatments, and surgeries, she wrestles with a tumble of tangled emotions, a shaken faith, and crushing self-doubt. And then, the unthinkable. Cancer is now threatening not only her own life but also the lives of both her parents. Through her raw, lyrical words, Hartke invites you to discover, as she did, that even in life’s hardest places, you are not alone in your fear, you are not foolish to hope, and you are never forgotten by a loving, pursuing God. Never.